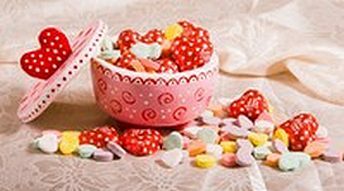 This adorable Valentine’s dish is a fun craft project for both adults and children. The dish is made from salt dough and requires very basic materials that you probably already have around your home. The lid has a heart-shaped handle, also made from salt dough. Mix together the flour and salt in a mixing bowl. Mix the water and oil together. Add half the water mixture to the flour and salt. Kneed the mixture, gradually adding more of the water/oil mixture until the dough has a smooth, firm consistency. Be careful not to add too much water or the dough will sag and become sticky. Remove the dough from the bowl and continue to knead for 10 minutes. Let the dough rest for 30 minutes in an airtight container. Grease the underside of the ovenproof bowl. Roll out the dough on baking parchment to ½ inch thick. Mould it over the ovenproof bowl and cut away any excess. Moisten your finger and smooth the edges. Roll four balls of dough, moisten them slightly and press into the base of the bowl as “feet”. With the bowl turned upside down on a piece of parchment paper, trace around the outer edge of the bowl with a pencil. Cut out the traced circle. Roll another ball of dough on the baking parchment to about 3/8-inch thick. Place the parchment paper circle onto your dough and cut out the circle shape. Cut a heart shape from the dough. Cut about 1/3 of the bottom of the heart shape off. Moisten the bottom edge of the heart and press onto the center of the lid. Moisten your fingers and smooth the edges of the lid and heart shape. Place the bowl and lid on a baking sheet lined with parchment paper. Bake for about 1hr at 275 degrees. Allow to cool. When pieces have cooled paint your own designs and colors on the bowl and lid. Allow paint to dry. Seal with five coats of varnish inside and outside. This free Valentine’s Day craft was kindly contributed by Heidi Ott, editor of Crafter’s Community.